At my company we are currently performing a pilot to see if we can offer corporate email to users through an Iphone. We decided to go for a simple setup: one dedicated Exchange 2007 Client Access Server facing the Internet (behind a firewall of course) using HTTPS and client certificates on the Iphones. There are plenty of guides out there that discuss this topic (with or without client certificates and with reverse proxy server infront of the CAS server) so I’m not going to elaborate on that .We did take some standard security measures like using the Microsoft SCW, enabling the Windows Firewall on the external interface and install a virus scanner on the CAS server itself. We were using Iphone 4’s with IOS 4.1 and Exchange 2007 sp1 RU 9. After we had rolled out the profiles the Iphone’s were syncing fine, but sometimes users weren’t able to connect to the server. One particular symptom that came up every now and then was that messages containing attachments wouldn’t send but would get stuck in the device’s Outbox. Some messages would remain stuck indefinitely while other would send after a certain time period. 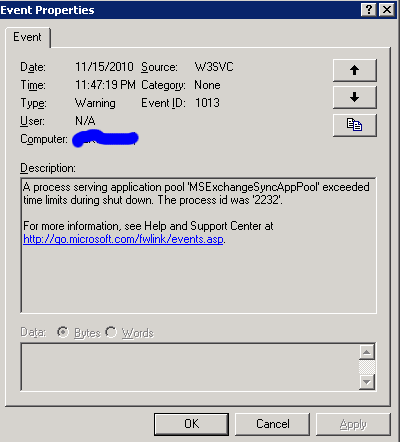 At times we would also see Connection_Dropped_By_AppPool MSExchangeSyncAppPool and the same error as above but with the actual send and save command string. We tested both and that had no impact. After that Icontacted PSS in order to jointly investigate the issue. They looked at the logs and we performed a trace but nothing really came up. I then used the adsutil script to set that value and voila! The messages were sent normally and the errors stopped occuring. 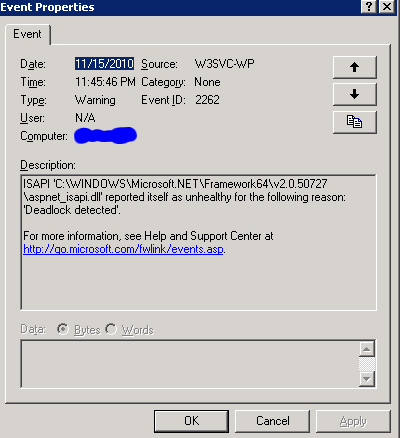 If you want apply either of those settings you should remember to restart the IIS Admin service and not just reset IIS. I’ve seen several posts on the web dealing with the same issue or at least the same symptom. They might be related to our issue and I think that the UploadReachAheadSize could also affect sending email messages when no client certificates are being used. In my earlier post I mentioned Opalis. Now what is Opalis? Opalis is an IT process automation tool. It gives you the possibility to visually design workflows that orchestrate, manage and monitor your whole process. By using integration packs Opalis is able to communicate with a host of different systems, vendors and platforms. You can get data out of systems, into systems and base your workflow’s logica on the repsonses you get from those systems. In the breakout session I attended Opalis was compared to a mainframe run book: a formalization of all the steps involved in a process from start to end. And because of the great interoperability you can start by taking your “informal” processes and putting them into Opalis – no chance in functionality but know you let Opalis handle the execution (for instance calling Powershell), the monitoring/logging (by raising an alert in SCOM if something goes wrong or even creating an incident in Service Manager) and the decision making logic. So instead of incorperating all of that in every script you find in your environment you create a template which you can then reuse for every task. Opalis itself was a so called third party tool vendor but is now a fully owned subsidiary of Microsoft and has been included in the System Center suite. In later posts I will try to get into the technical details of Opalis and how it relates to Microsoft Cloud management solution.